the wonderful world of lime! Building techniques and materials used in the past are very different from those employed today. Traditional buildings need to `breathe` in order to allow moisture inherent in a traditional construction to evaporate from the external stonework or render (whereas modern buildings use `barrier` techniques to keep the moisture out at all times). The central idea behind this being, when moisture enters a building it is able to pass straight back outside during the normal drying process. Lime Putty is the base product widely used to produce lime mortar, lime plaster and limewash for traditional buildings. Use of lime mortars, render and hair plasters is therefore not only historically correct, but essential when repairing an old house in order to maintain its structural integrity. 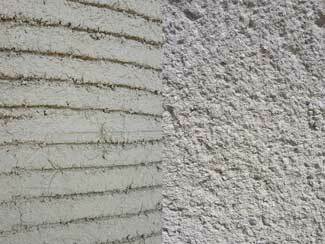 Lime mortars allow structures to breathe. 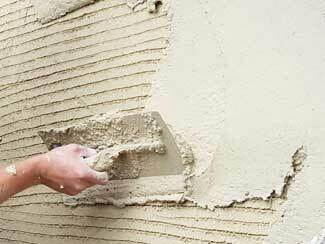 Lime mortars can accommodate general movement and have better elasticity. 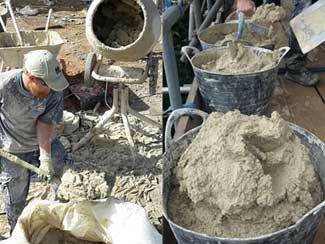 Lime mortars have the ability to `self-heal`, reducing cracking problems. Lime is exceptionally durable. Traditional farmhouses, cottages, castles, cathedrals and towers have stood the test of time for over 600 years, sometimes longer. Unfortunately, many traditional buildings are `repaired` or `improved` using hard and impermeable materials designed for modern buildings. In particular, hard cement renders, pointing and gypsum plaster. These unsuitable modern building materials trap moisture that is continually rising up from the ground, and stop it evaporating from your building. The results of which are plaster and render `blowing`, damp patches forming and woodwork rotting. Much of Woodlouse Conservation`s work focuses on rectifying these problems, employing the correct lime-based materials and techniques, and returning the properties to their former glory. Woodlouse Conservation is a family run building conservation and restoration team. We are based in Wiveliscombe, near Taunton, Somerset, but undertake work throughout the local area including Exmoor, Shepton Mallet, Tiverton, Wellington, Bridgwater, Minehead, Dulverton and Devon.